Discussion in 'News & Current Events' started by LostMarbels, Dec 19, 2018. It's almost as if taxpayers want the wall and are willing to pay for it. Even if not enough money is raised, the current 18,036 donations are more meaningful as implied intent than any signatures on a petition. 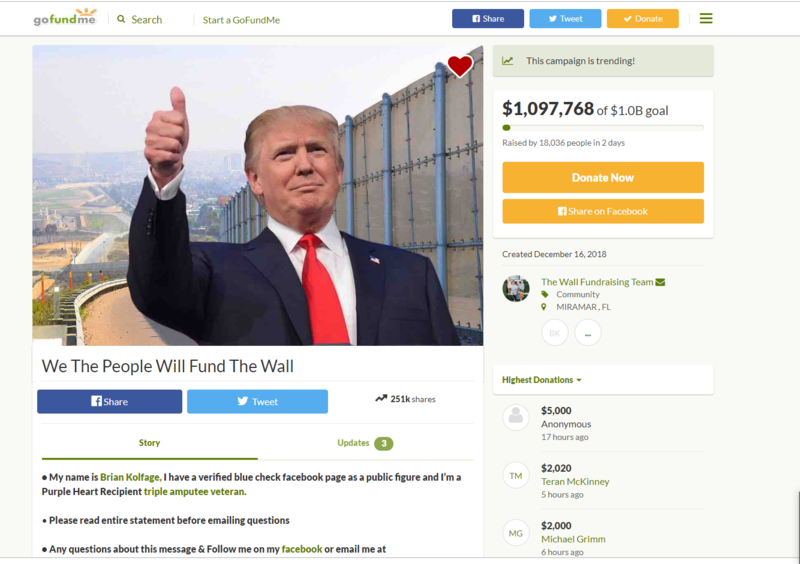 Every single donation to this fund is implied consent, willingness to fund, and approval of the wall backed be real world currency to be used for that purpose. *EDIT* Had to remove link per violation of CF rules. Looks like a stunt for Brian Kolfage to boost his Facebook profile. In before this turning out to be just a scam. This has been on Fox news, and other local news outlets. The individual in question is a real person, and his credentials are verified as that real person. Brian Kolfage is directly linked to this effort, and trending in the view of social media. He could not possibly pull off a scam without immediate repercussions. I support this move. Let those who want the wall the most pay for it themselves. When Mexico pays for the wall, will the donators be reimbursed? I really don't know. Actually... where do I send Mexico the link? $1 million in two days? $182.5 million in one year. OK, in about 28 years there will be enough to match the $5 billion that Trump wants now. This does not factor in inflation or leap years. $1 million in two days? $182.5 million on one year. OK, in about 28 years there will be enough to match the $5 billion that Trump wants now. This does not factor in inflation or leap years. I don't think that is the point. I am thinking the amount of donations representing how many americans want the wall versus what 'representatives' are saying is of importance. Say.... we should work on setting up some kind of system of 'representation' for us Americans. Like some sort of "House of Representatives" where these 'representatives' meet to discuss and debate the demands of American voters. I am very willing to let the wall be paid for by donation. Go for it. But, I should add that I am also horrified there are so many people willing to waste so much money on such a futile exercise. Indeed. 18000 of them, in fact. A quick divide by 300 million gets us to 0.006% of the population...wow, it's even less popular than we thought! Good find, LM, good find. Out of interest, were you one of the 0.006%? It's possible, but I kind of doubt it. The guy running it is a real pundit. He can handle the money properly and still come out way ahead with all the publicity this will general for himself. I don't think that is the point. What a great idea. Didn't the USA used to have a system like that? I think this is going to end up as a testament to how many people actually want the wall, and how much said 'representatives' are ignoring them for their own agenda. I think you are absolutely correct. It's currently at 0.006%, and if it gets even close to 0.1% it will still mean 99.9% of people are against it. Word hasn't even got out all that much yet. I heard this is going to be on Laura Ingraham. We will see. Not yet. I do not get paid until Friday. But yes, I will donate. Maybe the money raised could be put in Donald Trump's charity --- you know, for safe keeping? You only need 100,000 signatures in 30 days on an official federal petition for it to be granted merit. even if this is not a petition, a significant buzz surrounding this effort exceeding 100K donations will cause a stir. Facebook closed both of his accounts. He had one for his coffee business and one for news. At the bottom of his above post it says Freedomdaily.com. Freedom Daily has been rated as a fake news website by Politifact who has been working with Facebook to clean up Facebook. I have found no reason to think that Kolfage is being dishonest in collecting funds for the wall. It seems like something that he would do.